"Born a prince of Jotunheim and adopted by Odin, Loki can lay claim to both Frost Giant and Asgardian royalty. While this puts great power at his disposal, Loki's true strength comes from his talent for illusion and trickery. For all his skill at fooling others, Loki can't convince himself that he belongs anywhere. As an outsider in both lands, Loki constantly seeks ways to prove himself worthy, no matter how much his treachery hurts his family - and innocent bystanders." 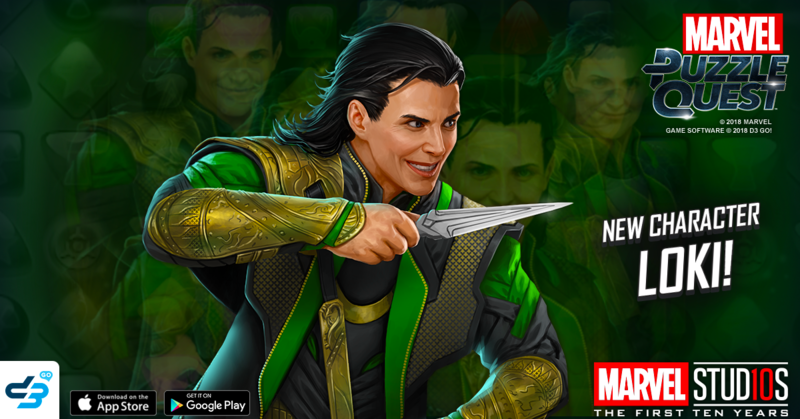 Check out the brand new 5-Star Loki, and find out how you can recruit him onto your team! Loki conjures replicas of himself to distract and confuse his foes. Creates 4 4-turn Shadowplay tiles - Black Countdown tiles that, if destroyed before going off, create 2 new Shadowplay tiles. After firing this power, it becomes Dagger Surprise. Loki springs from behind an illusion, pouncing on an unsuspecting enemy. Removes up to 3 friendly Shadowplay tiles, dealing 8,891 damage for each. When there are no friendly Shadowplay tiles on the board, this power becomes Shadowplay. Loki feigns death and lies in wait for the opportune moment to retaliate. When Loki becomes Downed, creates a Trap tile that, when matched, revives Loki with 62% health and generates 3 Green AP.